50 shades of pink dominate my garden this week. Okay, well maybe only 10 or so. The most grandiose is the crinum. The tiniest is my new Phlox paniculata ‘John Fanick’. It’s been on my list for years! When I ran into some in May, I nabbed them faster than a bunny on a banana. And they won’t be that tiny next year. Every day, I drive by some that are just under 2′ feet tall, in blasting heat, blooming like nuts. Speaking of bunnies, evergreen small shrub Mexican oregano (Poliomintha longiflora) droops over a garden sign my sister-in-law gave me years ago, when I never dreamed of having a bunny. Now, house bunnies Harvey & Gaby like cuttings for snack time. Edible for us, too! Hummingbirds hone in on the flowers. Most romantic: plumeria. I have them in large pots to bring to patio-covered warmth in winter. These are quite xeric plants if you want some “container bold.” They like to go dry between infrequent waterings. I’ve noted that too much sun can cause sun scald. This year I moved them to a spot where they get sun, but relief from hot afternoon blasts, and they’ve been much happier. Of course, summer 2011 was a little brutal. Annual angelonias can take the heat and all the sun in the world. My purples in sunny spots deepen the palette. In semi-shade, annual but re-seeding Salvia coccineas sweetly flower against Agave celsii. My celsii took a hit in our two sharp winters, but has rallied. Since hardy agaves are lovely textural additions to the waterwise garden, this week Tom joins Bob Barth, founding member of the Austin Cactus and Succulent Society, to look at a few. An important point that Bob makes is the big mistake among new agave gardeners: at the nursery, they see three pots like this. Two will stay under 30”: Agave parryi var. truncata and Agave parrasana. One, Whale’s Tongue agave (Agave ovatifolia), will get really big! Here’s Bob’s list with sizes and offset tendency. We didn’t have time to mention two on his list for shade. The variegated one is Agave lophantha ‘Quadricolor’, now on my list! The other is Squid agave (Agave bracteosa). I have ‘Calamar’ in a pot, a gift from designer Patrick Kirwin. Another is in grit-amended clay soil with ‘Blackie’ sweet potato vine nearby. Both of these squids get “psycho lighting,” shade a lot of the day and blasting afternoon sun for a few hours. They handle it just fine, along with freeze, flood, and drought. Bob Barth was the man who introduced me to agaves way back when. One I got from him is Agave striata, still in a pot. I’ve considered amending the soil enough to let it go free in the ground. At the same time, although this is a smaller agave, its enforced restriction is just about right for me in this spot. Now I want to add A. striata ‘Live Wires’, one of Bob’s featured plants on CTG. In sun, its leaves can turn lavender. Oh, must have! One of the first I bought from Bob was Agave gemniflora. It’s been my favorite patio plant in part shade since then. It’s not cold hardy but has made it through 14° in our patio winter greenhouse. I almost never water it. Jeff Pavlat, also a member of the Austin Cactus & Succulent Society, who’s found a great teacher in Bob, too (and now his assistant in Bob’s private nursery, Oracle Gorge),takes on Backyard Basics this week to demonstrate how to repot spiky cacti and succulents. Here’s Jeff’s potting mixture. You can meet them both and lots of neat plants at the Austin Cactus & Succulent Society Show and Sale on Sept. 1 and 2 at Zilker Botanical Garden. So, can even our hardy plants, like succulents, be sun scalded? Indeed, they can! This week Daphne explains what happens. My Sedum mexicana isn’t thrilled about the grueling spot I gave it. The ones I have in a morning sun patio pot (and that self-propagated in a bed nearby) are much richer in color and more prolific. Back to the pink theme, Daphne’s Pick of the Week is Ruby crystals grass (Melinis nerviglumis) ‘Pink Crystals’. Thanks to Jennifer Stocker for this picture. She has the most incredible garden and equally outstanding blog, Rock Rose! On tour in San Antonio, see how Richard Blocker from the San Antonio Cactus & Xerophyte Society swapped lawn for hardy cacti and succulents and how he protects his succulents from sun scald. 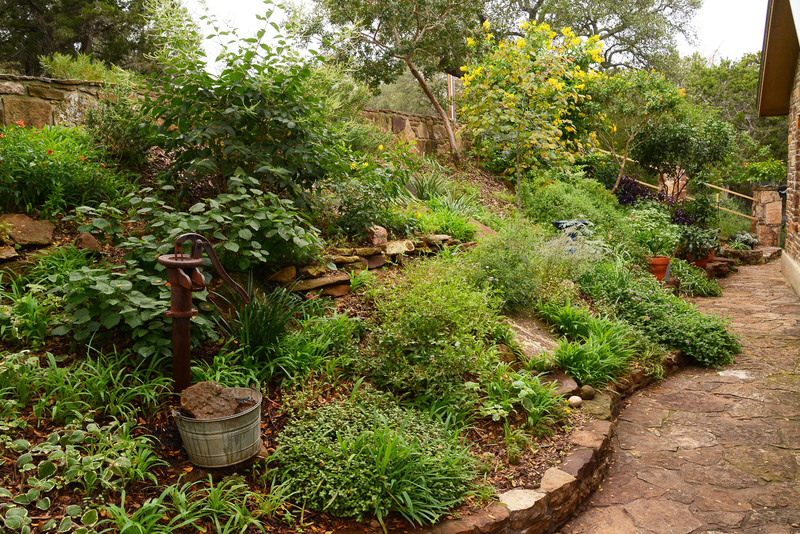 ← Garden Psychology: What Does Your Garden Say About You?